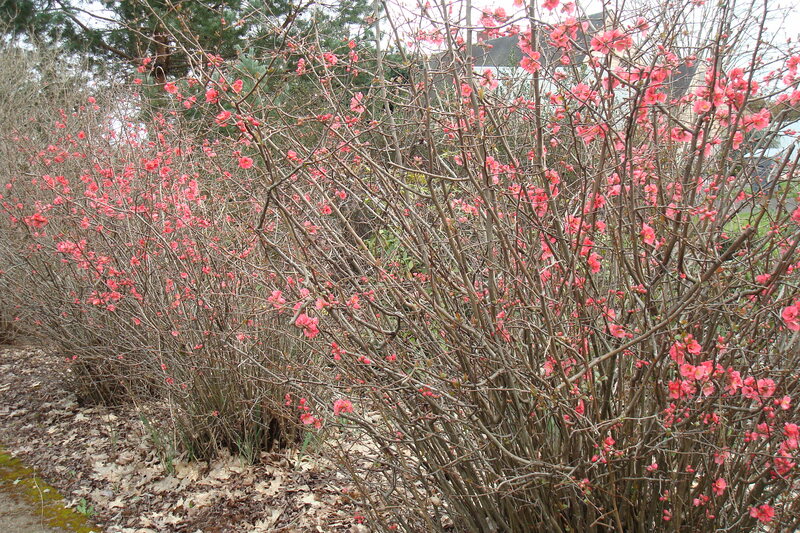 The shocking pink flowering quince have blossomed. This shaggy shrub needs pruning. Just when we thought spring had sprung, near freezing temperatures plunge us back down again. But apparently that’s typical for Oregon in March. I’m finally learning the rhythm of her seasons. We had balmy weather this past month, making it hard to fathom the snowpocalypse that descended on our loved ones back East. But then snap! it turns cold here and Mom’s on the phone from Virginia, talking about her beautiful, seems like the upper 60s, spring day. 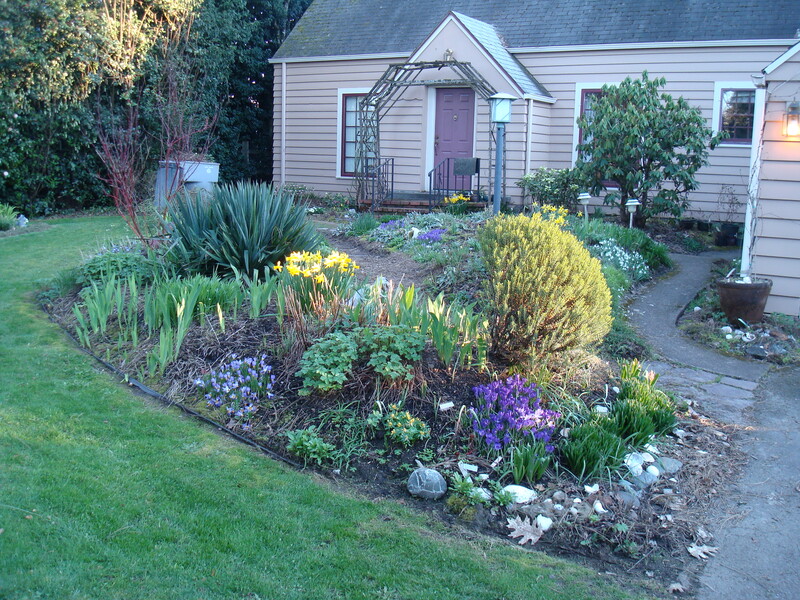 It’s hard to figure out how unpredictable spring affects one’s garden. Survival of the fittest, right? I was concerned about the rhubarb and strawberries and peas growing most vigorously, so I threw some plastic bags over them. Maybe I’ll build a plastic hoophouse for protection, oh, one of these days. For now, I’m a laissez-faire gardener. So I fitfully sowed tiny carrot, radish, lettuce and spinach seeds, allowing them to come up where they like. With them and the onions, I tend to oversow seeds too tightly together. It’s just so hard to fathom each will become a full-size vegetable. I’ll just have to remember to thin when they sprout. Now if that cold would only kill off those ubiquitous garden slugs I tend to murder almost daily. Speaking of cold, we finally got some much-needed weatherization work done on our 1939 house today. 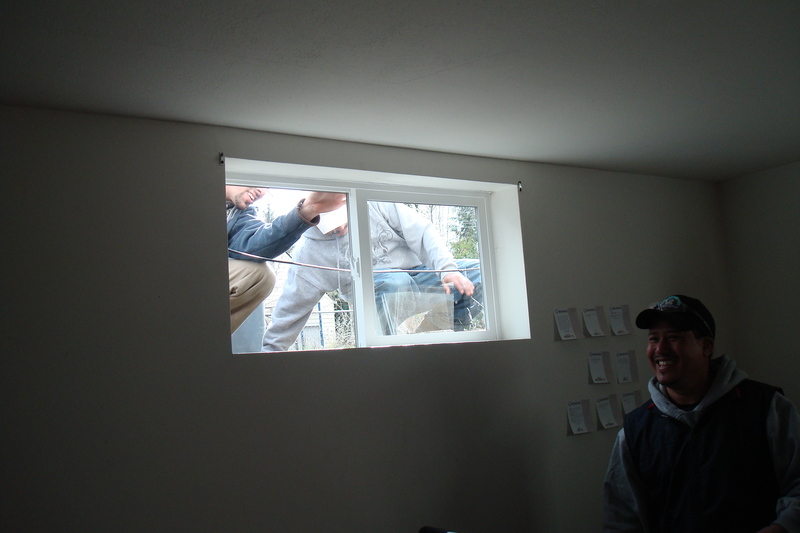 I’m most excited about scrapping the drafty aluminum sliding basement windows, which were replaced with much more insulated (and easier to climb out of in case of fire) vinyl ones. We care because we sleep in the room. We also had insulation blown into the attic. I have only kind words so far about Total Comfort Weatherization, which is also supposed to help us with paperwork for all the state and federal tax credits once the work is done. Lucky to live next to master gardeners. 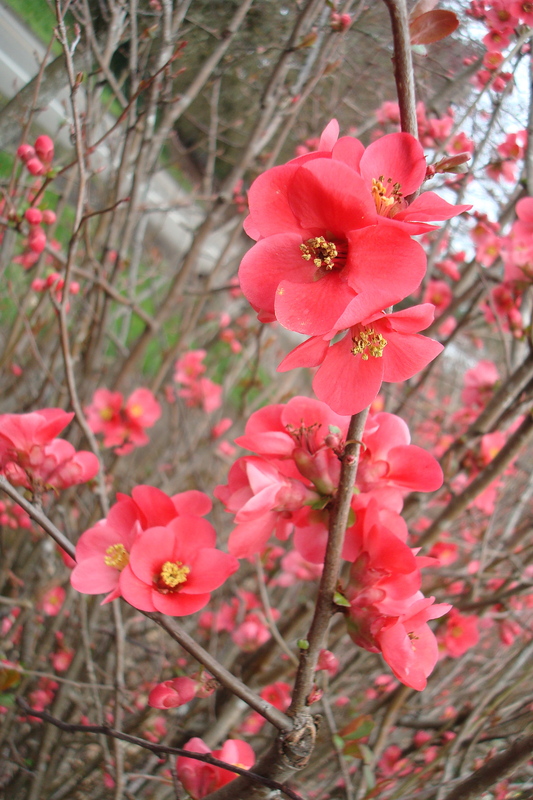 Your flowering quince is gorgeous – looks especially good after this harsh winter. We still have a few patches of incongruous snow around here but forsythia are starting to bloom around town, too. So many of our well-established older plants really took a beating this winter, from wind and the weight of all that snow on them. Deer have decimated many of the plants in our yard that they would have scoffed at in milder winters. Please continue to post about the progress of your garden! I hear it’s nice there finally. I think the cold snap in December killed our eucalyptus tree. We need to cut it down. The dead bark still smells so good though!